Key Point: Do not let our Call to Worship begin with a focus on man's needs. It needs to focus on the character of God. It is a call, not a request. It is a proclamation of God, not an appropriation of God for the purposes of man. "Good morning! Let us rise and read the call to worship," says the worship leader. Seems quite normal and familiar right? Now, something does not seem quite right with that. What's wrong with that? Here is what's wrong. A) What is the Call to Worship? A call to worship (CW) is not about begging people to read something together. Neither is it merely getting people to read something in order to get the worship going. It is also not a form of "warm up" to the rest of the worship service. Instead, it is a rousing exclamation to all believers to come and worship. Note the passage above about the coming of the Son of Man. The angels appear with a "loud trumpet call" and "gather" the elect from all over. It is loud. 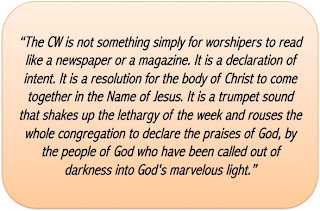 Like ringing the school bell to signal the start or end of a school session, or the emcee who calls upon everyone seated in the stadium to stand to sing the national anthem, the CW is an active trumpet call to all in the Church to come. Brian Doerksen's song begins well. A CW is a call. It is a calling to the called, a declaration of the start of praise, and a cry for action. It is not to be muted into simply a word to be said or an item in the program sheet. It is purely and simply a call. Let those who have ears be ready to listen. 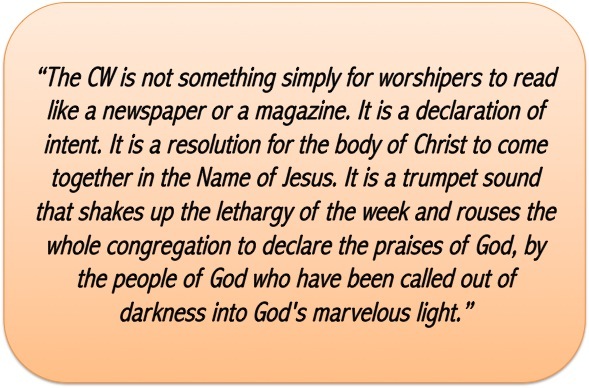 The CW is not something simply for worshipers to read like a newspaper or a magazine. It is a declaration of intent. It is a resolution for the body of Christ to come together in the Name of Jesus. It is a trumpet sound that shakes up the lethargy of the week and rouses the whole congregation to declare the praises of God, by the people of God who have been called out of darkness into God's marvelous light. KEY: The Call to Worship is not a request for people to straddle into the sanctuary. It is a trumpet sound that declares the time for the elect, the called to come together to worship God in Spirit and in truth. B) Why the Call to Worship? Look at the verbs at the beginning of Psalm 95. The call to worship can lead to singing praises, shouting gratitude, coming in thanksgiving, and extolling God in song. Look at Matthew 24 again on the coming of the Almighty God. Before the coming of the Lord, the angels go forth to summon the people to gather and to be ready. I remember attending a special event not too long ago. The organizers make repeated calls for people to be early and to be promptly seated in anticipation of the coming of the guest of honour. This is the same as the commencement ceremony of a college graduation event. The moment the chancellor and the various dignatories arrive, all the guests and graduands stand up. The CW is exactly that. The angels go forth before the coming of the Lord to call all in preparation for worship. At the trumpet call, we all behold the Lamb. We bow down in worship. We praise God. The CW is a call to start looking and gazing at the beauty and majesty of God. Like the referee that blows the start of a football game, the CW marks the start of the worship service. There is also a practical reason. For six days we busy ourselves with the affairs of the world. We work hard. We play hard. We do good works. On the seventh day, we stop. We pause. We stop our regular mode of activities and we summon ourselves to worship God for who God is, regardless of how we think or feel. In our modern world of electronics and digital gadgets, we are frequently connected. We are constantly in touch. Yet, how often are we in touch with God in the normal day? Well, I know of people who will hardly think about God. Perhaps, the CW is an opportunity to just switch off our gadgets and our connections to the world, and to turn on our attention to God. The CW is that call for all to focus on all things God and God alone. KEY: The CW is necessary simply because it marks the beginning of the worship service. C) What Makes a Good Call to Worship? It is important for the CW to be direct, simple, corporate, and must reflect the character of God. Direct in a way in which people know for sure that a response from them is required. No wishy-washy words that seem to sound nice but does not really mean anything much. It must be simple enough for everyone or most to understand. There is no point using big words that confuse people. If big words are used, make sure there are simpler synonyms to accompany them. It must also be corporately addressed. The CW is not simply an individual call. It is a calling to the ekklesia, the called-out people, the Church. A call to worship is like a trumpet call for people to gather together. It is not a meek request or an invitation to come. It is a call to come. It is a calling for the called to begin in earnest worship. It is calling the ekklesia to bring to the Lord a new song, their offering of praise and thanksgiving. A good CW must also reflect the character of God. This is critical because God can only be matched by God himself. Remember how the LORD answers Moses's question "Who are you?" The LORD said: "I AM who I AM." It means that God is unique and so supreme that there are no superlatives, no adjectives, and no additives that can ever match up or describe God. God can only be fully described by God himself. All worship must stem from the character of God. Let me give three examples of good CWs. Second, use a good hymnal. 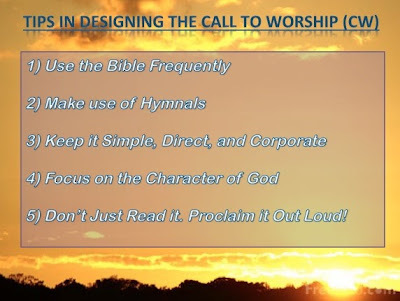 Many of the modern hymnals, prayer books, and worship resources contain helps for designing a good CW. The words of hymns can also be read. Worship leaders need not use whole hymns, though they can if they want. They can read from one or two stanzas, a chorus, or something that is concise and able to focus the congregation upon the Person of God. Leader: "The Lord is risen!" People: "The Lord is risen indeed!" Leader: "Glory be to the Father." People: "Glory be to the Son!" Leader: "Glory be the Holy Spirit"
All: "Glory to the Three in One!" "Ok. Let us all put aside our worries and our cares and then focus on God." "Are you all feeling alright? Let's get started." "We are all tired from the week. Some of us are lonely. Some of us are sad. Some of us are downright unhappy and unwilling to worship." Do not do that! Warning. If we begin with a focus on man's needs. Our worship will be like trying to fire a rocket horizontally. It will land with a thud. Worse, it will be elevating man's needs more, turning worship services into a therapeutic session. God forbid. The CW is a call based on God's power, glory, magnificence, and holiness. It is all about God. KEY: The CW is not meant to direct our attention to one another. It is meant to direct one another toward God. Do not take the CW lightly. It is not simply a precursor to the sermon. It is a proclamation of the kingdom and glory of God. It is a statement of intent that we have come to worship God in Spirit and in Truth. God's Truth. Let me close with two examples of a good CW. May we all learn to appreciate what the Call to Worship (CW) means. I pray that the CW will be truly a call for all of us to enter fully and surely into worshiping God in Spirit and in Truth. Turn off our cellphones and turn on our focus on God. Tune into the Spirit. Sing out to the LORD. Don't just read the CW. Declare it. Proclaim it. Shout it out to the LORD!